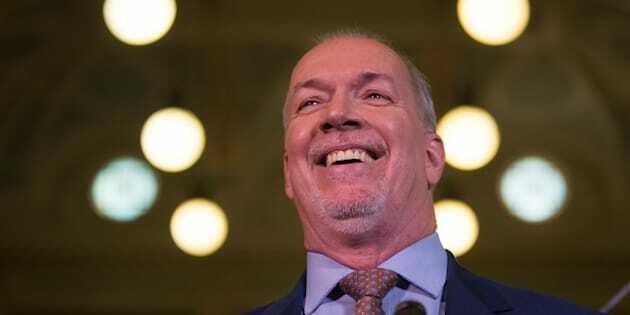 Most Popular Premiers Poll Finds John Horgan Enjoying Strong Support In B.C. Ontario's premier, however, is another story. John Horgan reacts outside the gates of the British Columbia legislature building in Victoria, B.C. on May 29, 2017. B.C. 's new NDP premier is enjoying strong support from his province's residents just over two months into the job, a new poll suggests. The Angus Reid Institute's quarterly survey shows John Horgan's approval rating stands at 48 per cent. The firm says that's six points higher than any rating ex-premier Christy Clark scored in its past polls. Thirty-seven per cent of respondents disapproved of Horgan's performance. Horgan was sworn in as premier in late July after the NDP teamed up with the Green Party to kick the minority Liberal government out of power. The strong support might not last, however. ARI points out that such a healthy approval rating is not uncommon among newly-elected or recently re-elected leaders. "Time will only tell how long Horgan's honeymoon period with British Columbians will last," the institute wrote in its report. There's one premier that has defied that trend, however. Almost two months after he announced he would be resigning and leaving political life behind, Saskatchewan's outgoing premier Brad Wall is enjoying an approval rating of 49 per cent. That's four points higher than the 45 per cent rating he registered in June — his all-time low. Ontario Premier Kathleen Wynne enjoyed a slight uptick in her approval rating, which rose to 17 per cent, but held on to her title of Canada's least popular premier. Wynne's level of support hit an all-time low in March when it dropped to 12 per cent. Only two premiers— Manitoba's Brian Pallister and Newfoundland and Labrador's Dwight Ball— saw a decline in support compared to their scores from last quarter. ARI's poll was conducted online between Sept. 5-19, 2017, among a representative randomized sample of 5,466 Canadian adults. For comparison purposes, a probability sample of this size with would carry a margin of error of plus or minus 2 per cent, 19 times out of 20.